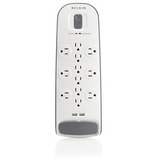 The Belkin 12 outlet surge protector is perfect for home office use. With 6 regular outlets and 6 Blockspace™ outlets, this protector can handle even oversized printer and charger plugs. The convenient USB ports allow you to charge your phone or MP3 player while working, surfing or checking email. This surge protector also features 3996 joules of protection to keep equipment safe and advanced power filtration to help maintain data integrity and optimal system performance.